I think Daniel Quinn has hit upon something very special in his Ishmael books. That special thing is a concept, or way of looking at human history, that tells the story of how people came to be the way they are. Mr. Quinn tells this story through his fictional teacher who seeks students to learn his insights and pass them on. That teacher is a sentient gorilla by the name of Ishmael. Ishmael teaches by telling stories and engaging his pupils in a Socratic dialogue. He wants to lead them through a string of linked concepts and so get them to figure his lessons out for themselves. This can be trying for his students, but is so much more effective than if he had, say, tossed them something printed to memorize. His students of the first two books become quite passionate about what they learn and so vindicate his methods. Of course, it is Mr. Quinn that is teaching the reader by means of this fictional account of the gorilla and his students. That teaching ("...how you came to be the way you are...") is the overarching object of the books and is what engrosses fans so much. But Mr. Quinn never forgets he is writing a novel and maintains an interesting storyline with sympathetic characters throughout. His balance in presenting an account of anthropological history while telling a fantasy story is excellent. 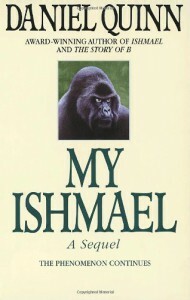 My Ishmael, the sequel to Ishmael and the subject of this review, is a true sequel in that it extends the story of its predecessor. The first book ended with a finality that would seem to preclude sequels. Staying true to that finality, Mr. Quinn set My Ishmael in the same time-frame as the first book, and interleaved its storyline through the gaps. This works. In My Ishmael, Ishmael's pupil is a precocious twelve-year-old girl named Julie Gerchak. We learn, with Julie, the second concept that follows from the one in the first book. These two concepts are the anchors for Ishmael's teachings. The second concept is revealed in My Ishmael and is the brilliant idea that allowed the Takers to so effectively impose their life of hierarchy, privileged class, and endless work benefiting the rulers, on the peoples around them. These peoples were living in tribes and hunting-gathering. Ishmael calls them, the Leavers. This Taker idea was extremely effective and continues in effect to this day, dominating the lives of all human beings not still living in tribes on the outskirts of civilization. This idea of Takers and Leavers is one of the most profound in the books. I find I cannot look at the world situation without using this idea to understand events. It contains the concept of class struggle and shows capitalism and materialism as natural expressions of the Taker way. In My Ishmael Mr. Quinn presents many ideas and images extending from the Takers-and-Leavers concept. They are many and they grabbed me to the point that I made profuse annotations and dogeared pages as I read through the book (several times). Let me list a few to give an idea of what's there, and include a few criticisms. ...she started putting on weight big time. Luckily, she already had a good job. She heads up the word-processing operation at a big law firm downtown. And then she took to "stopping for a drink after work." This got to be a pretty long stop. We think you're crazy to knock yourselves out dancing fifty and sixty hours a week, but that's your business. If you like it, you do it. But we're not going to do it. But there is a strand of materialism that runs through the book that I don't care for. Like the part where Ishmael is telling Julie that people can know a lot more than they do, but cultural boundaries keep them from inquiring. They believe that they are"deprived of essential knowledge" and that this knowledge can only be accessed "through supernormal means--prayer, seance, astrology, meditation, past-life reading, channeling, crystal gazing, card reading, and so on." Julie calls this kind of thing, "hoogy-moogy." While I believe there is truth to what Mr. Quinn is saying through Ishmael here, it's not the whole story. There are good reasons to investigate the paranormal and they're not based just on wishful thinking. What's happening in that part of the world is merely the latest calamity in a calamitous history that can't be made right by any means whatever. I've heard that sentiment expressed (far more crudely) many, many times regarding the turmoil in the Middle East. To me, it sounds too much like saying, those are bad and/or crazy people "over there." The truth is, they are violent, when they are violent, because we attacked them to steal their resources. I don't, however, judge this book on these criticisms. They are minor compared to the insight Mr. Quinn offers. It is especially powerful for me when Ishmael talks about our culture's delusions concerning work (our jobs) and our system of education (or lack of the same). The chapter called, My God, It Isn't Me!, tells the story of Jeffery, a young man who "presented people with a problem," basically because he couldn't bring himself to fit into our Taker culture. I can relate to how he failed to cope, and it makes me wonder about people who we label as, "losers." I hope I've whetted your curiosity about My Ishmael enough to get you to read it. I would, however, recommend you read Ishmael first. What is there to find in both books is insight into the current human situation, understood from a study of our past. But I warn you, if you approach that study with an open mind, you run the risk of waking from the delusion that our culture ensnares all of us with. And that's just the beginning. When one is so awakened, he or she finds there is a whole new path in front of them. It can be an unsettling one to follow. By refusing to teach your children how to be prisoners. That's Ishmael's mandate to us--one person at a time, changing their minds and determining to live differently and teaching their children that they can do the same. If you can understand this and commit to the idea, you'll have found the gem buried in this book. Making personal application of this teaching will open you to the potential for a better way, and you'll have found your Ishmael.